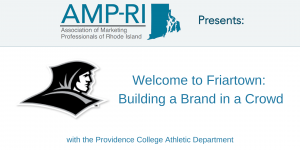 embership in AMP-RI is an effective way to support and further your career in advertising, marketing and/or public relations. Your presence on our website and at our meetings will greatly enhance your networking, and may bring you opportunities to share projects, problems, and solutions with other communications professionals. Annual membership for new industry professionals is $60 per year ($30 for students). Increased visibility is just the start. You’ll be listed on our website and be the first in line for industry updates. Your profile will feature a link to your social presence of choice: email, website, Facebook, LinkedIn, Twitter, portfolio or other social sites. Networking opportunities with other marketing and communication professionals – and more exposure could become more business! Best Of All: Members Attend All Presentations FREE! Our monthly Spotlight presentations are always a great way to learn something about our industries. With time to network before and after, our presenters are experts in their fields and take questions from attendees. Attending presentations by expert communicators. Sharing ideas with, and getting feedback from, other professionals to help you improve or expand your business. Honest project feedback from our experts – who enjoy also being mentors. Find creative solutions to business and marketing problems. Share resources locally and online to help you with your business, marketing, and advertising efforts. Speakers share topics on a variety of topics, including digital, social and mobile marketing; print advertising; strategic business growth; small business leadership; public relations; establishing a professional image; and much more. Is there a topic you’d like to see? An industry you’d like to learn about? Know someone who’d be a great speaker? Let us know! You’ll meet with others who know what is going on in the communications industry and local market. Increased ideas – and we all know what happens when a group of creative people get together! Referrals – we always refer to members when asked. Looking for a job? Have an open position to fill? Let us know and we’ll send your resume or job description to our mailing list of over 400 local communications professionals. Find go-to partners. Whether you are hiring or need a subcontractor or service provider, you have a community who can recommend partners to you. Members attend all presentations for free! You can register online today. Your membership dues will put you on the path to join in the fun and enhance your career. Membership for new industry professionals is $60 annually. Student membership is just $30. With events at $10 plus individual ticket fees in advance, or $15 at the door, you can quickly recoup the financial investment, among the many other benefits! Register below today.